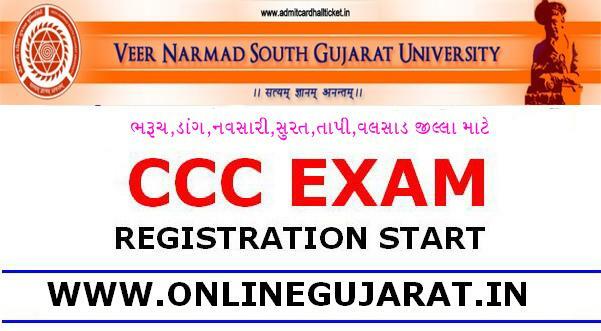 VNSGU CCC Online Registration 2017 : VNSGU has published notification for CCC examination for govt employees belongs to Bharuch, Dang, Tapi, Surat, Valsad, Navsari districts only. Those employees want to apply online may visit VNSGU official website and apply online before 09-10-2017.for more details for VNSGU CCC Registration 2017 are mentioned below. Exam for : Bharuch, Dang, Tapi, Surat, Valsad, Navsari districts Govt. Employee. Click on “Sign Up Here” to create Account. Click on “Sign In” to login. An Applicant has to submit form to the post office along with the fee. Please attach photo ID proof document with the application (Employ ID), otherwise your application will be rejected. An applicant must submit their application to the post office on or before 30th November 2016. During examination candidate has to bring Employ ID and license/Adhar Card/Passport/Election Card or PAN Card (Any One) without fail.